Here are the Office Space we Have Currently for Lease in Detroit Metropolitcan Area. Nourtel Place offers you a quiet, safe, affordable and professional office space environment in a central location. Close to restaurants, I 696, M-10 and on Telegraph. Rental Rate: $10.50/sq ft for large office with long term lease. 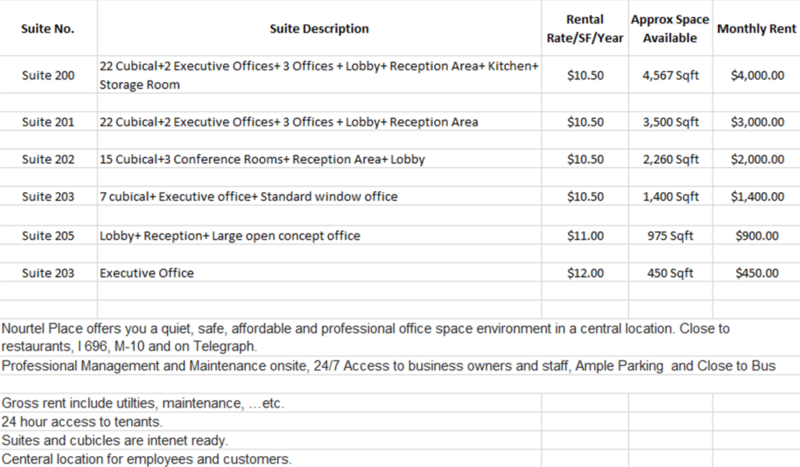 Rental Rate: $12-$13/sq ft for small office with 1 year lease. Description: Professional Management and Maintenance onsite, 24/7 Access to business owners and staff, Ample Parking and Close to Bus stop. Gross rent include utilties, maintenance, …etc. 24 hour access to tenants. Suites and cubicles are intenet ready.